Shri Mallikarjuna Temple has been dedicated to Lord Mallikarjun who is an incarnation of Shiva. The shrine is said to be one of the oldest ones in Goa and is nestled amidst the most stunning natural surroundings of the valley that is surrounded by mountains on all sides. It is believed that he temple has been constructed somewhere during the middle of sixteenth century. The environment inside the temple is absolutely serene and you would be able to find inner peace. The architecture is splendid, and you would be able to find beautiful wooden carvings inside the temple. The main deity is known as Advat Sinhasanadheeshwara Mahapati and there are over sixty Hindu deities in the temple. Visit the temple to seek the blessings of God, admire the architecture and for a religiously enriching experience. Follow the Hindu religious customs inside the temple. The best time to visit would be between 07:00 am to 03:00 pm. Take a car or taxi. How popular is Mallikarjun Temple? People normally club together Palolem Beach and Patnem-colomb Beach while planning their visit to Mallikarjun Temple. Loved this maroon and white Shiva temple. Peaceful with a good view in the background.must visit. 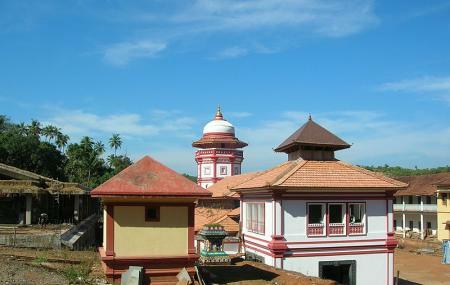 Nice temple in Canacona, Goa with marriage hall associated with it. But the place is far from the main road. One need own vehicle or two wheeler to reach here.